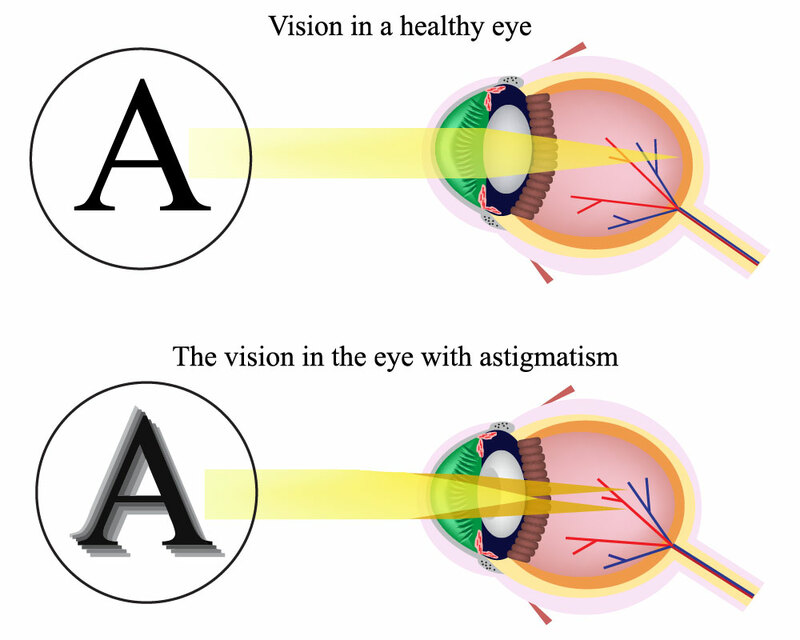 It’s common to hear the term astigmatism. Perhaps, your friend or a family member has been told that they have it or maybe you have it yourself. But what does that mean? Astigmatism is a common eye disorder affecting millions of Americans every year. It is not a serious or life-threatening condition. Astigmatism is an imperfection in the curvature of your cornea — the clear, round dome covering the eye’s iris and pupil — or in the shape of the eye’s lens. Normally, the cornea and lens are smooth and curved equally in all directions, helping to focus light rays sharply onto the retina at the back of your eye. However, if your cornea or lens isn’t smooth and evenly curved, light rays aren’t refracted properly. This is called a refractive error. When the cornea has an irregular shape, it is called corneal astigmatism. When the shape of the lens is distorted, you have lenticular astigmatism. As a result of either type of astigmatism, your vision for both near and far objects appears blurry or distorted. It’s almost like looking into a funhouse mirror in which you appear too tall, too wide or too thin. People can be born with astigmatism — in fact, most people probably are born with some degree of astigmatism, many are so minor they are overlooked. While adults with a higher degree of astigmatism may realize their vision isn’t as good as it should be, children who have astigmatism symptoms may not be aware they have this condition, and are unlikely to complain about blurred or distorted vision. But uncorrected astigmatism can seriously impact a child’s ability to achieve in school and sports. And some forms of astigmatism can be a sign of keratoconus, a cone-like bulge of the cornea, which can distort vision. That’s why it is crucial that children have regular eye exams to detect astigmatism or other vision problems as early as possible. Think you might have an Astigmatism? Schedule an appointment today.